Science Education through Earth Observation for High Schools (SEOS) is an initiative for using satellite remote sensing of the Earth in science education curricula in high schools. The project was funded under the 6th Framework Programme of the European Commission (EC). Implemented by 11 partners from various European countries and in cooperation with the European Space Agency (ESA) it offers 17 tutorials on selected environmental and technical topics. The tutorials cover many disciplines such as physics, biology, geography, mathematics and engineering, focusing on the interdisciplinary character of remote sensing. We appreciate any kind of feedback regarding suggestions for improvements and possible mistakes in the tutorials. Please send your comments to the project coordinator Rainer Reuter. 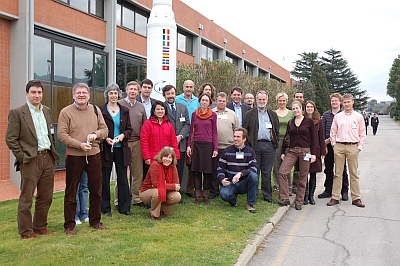 The SEOS team at a project meeting at ESA/ESRIN in Frascati, Italy, February 2008.